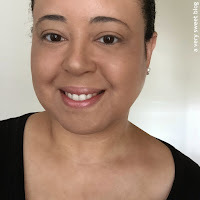 Benefit's Sun Beam Golden Bronze Complexion Highlighter (that I won in a Klout Benefit #Curlfriends Contest), made me think about AND question the collection of highlighters I already own. I had to do a little research. Do I own any highlighters that are GOLD? HaHaHa I went in my makeup stash to look and the gold highlighters that I own are The Balm's Mary Lou Manizer , Tarte's Park Avenue Princess , Urban Decay Naked Flush In Streak (all are champagne gold) and MAYBE Etude House White Chocolate Highlighter from Sweet Recipe. 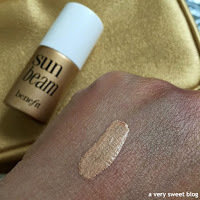 All were given a sweet rating (UD supersweet), but I think Benefit's Sun Beam in LIQUID GOLD beats them all out! What do you think? 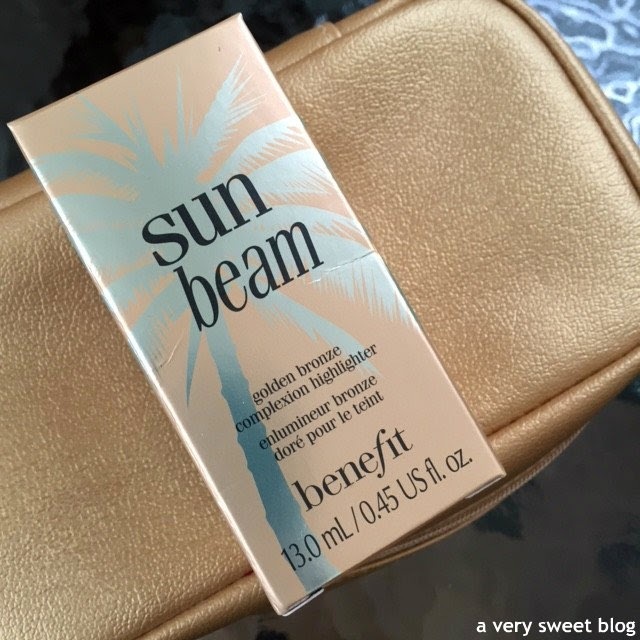 Benefit accurately describes this as, 'liquid sunshine in a bottle' and boy does it pack a punch. 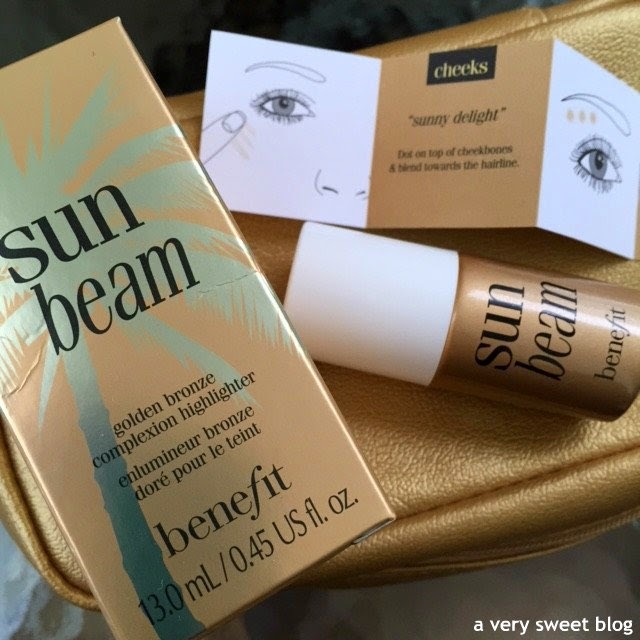 This stuff illuminates your face! It gives a contouring effect. Light is in the inner portion of your face (nose eyes & cheeks) and shadows surround the light. Benefit suggests dotting/dabbing this on the apples of your cheeks and underneath your eyebrows. I found an old HSN presentation, where it was suggested over the eyebrows! So I went with that one, personally for myself. I used my Tarte Foundcealer Foundation, added Benefit's Hoola Bronzer and then Sun Beam. Sun Beam really added LIGHT to my face. When you initially apply it, you won't see the light. I was like, ummmm, I'm not seeing THE LIGHT... this isn't working! HaHaHa But it has to dry (give it less than a minute)! Once it dries, you'll see a beautiful glow! This gives me hope to contour. LOL I know I promised a Tarte Poppy Picnic Palette Review & Giveaway this week, BUT I didn't make the video for it yet :( Soooo, I'll post it on here Monday (Memorial Day). Have A Great Weekend! thanks for sharing this, kim! looks like a nice product. This product looks like must-have on the summer, especially I'm sure this would look stunning on tanned skin :) I really like effect of this product on your skin, Kim! This product does give a lovely glow it looks fabulous on you. Great to wear during this time of season. Have a great weekend Kim. 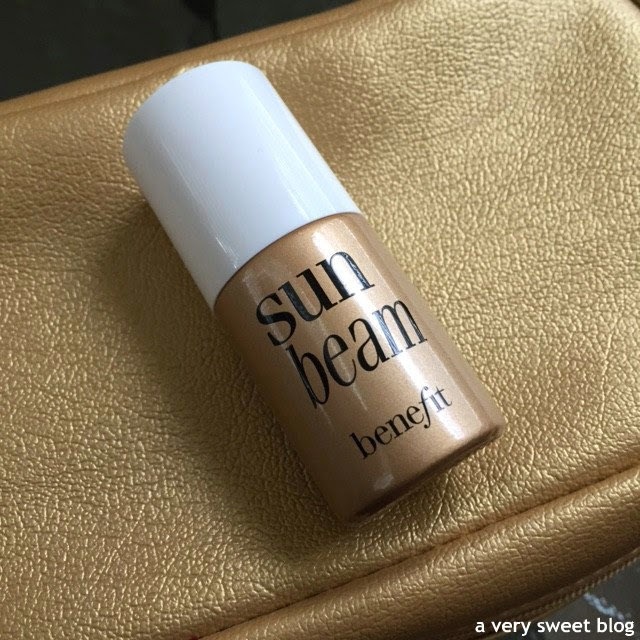 Thanks for the review, it looks like the perfect summer highlighter! Oh wow it's so pretty!!!! It's subtle, but really lovely. Love it! Have a great weekend dear! This is nice. And I like the way you apply it too. Happy weekend cupcake! 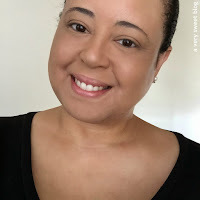 Great post & video Kim! 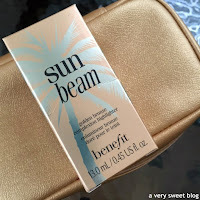 I have Moon Beam from Benefit, and it's a little too pink for me. This looks gorgeous! I bought this a long time ago and I agree, it's one of the best if not the best highlighter for medium and darker skin. Regardless how many highlighters I tried, I will always go back to this. Love the review, Kim and you know what I love even more? That we seems to share the same opinion in a lot of products. LOL! The effect of this one is so pretty Kim! You totally have a sun kissed glow but it looks really natural at the same time. Enjoy your long weekend! I've never tried Sun Beam, but Benefit used to have another highlighter in a bronzy-gold shade that I absolutely adored and although this doesn't look similar in the package, it does on your face. Definitely going to have to give this a try, I was so sad when they discontinued the old one! Ooh, that is a really nice product! Perfect for a night out! You have amazing skin, Kim! Have a nice weekend! my friend just adviced me! cool post! You have a great weekend, Kim! I've been wanting to try that for a while! Great review - definitely should buy it! This is one of the most wearable gold highlighters I have seen. Some of the gold ones are a little scary to me. This looks like it would be beautiful on anyone, and it looks stunning on you! This look so amazing on you! I definitely need to go check out the Benefit section next time I am in a store! So gorgeous, we're loving the golden hue and looks like a highlighter we might have to try! This highlighter is so gorgeous on you Kim!!! I love the videos you are making! I like to see everything in action haha! Looks so natural on you with a golden glow. This highlighter looks gorgeous on you Kim! wow this looks like an amaing product, thanks for sharing! It looks very natural, the glow is not too much and I think that is the most important for a highlighter!! I love a bit of glow, as long as it looks natural!! This products looks really good! Gosh this is pure gold!! I think it goes perfectly with the Hola bronzer and you did a great job applying it! Love this review, but I may be biased because I LOVE this product! i have this one and i totally adore it! OK, now I've to have it!! 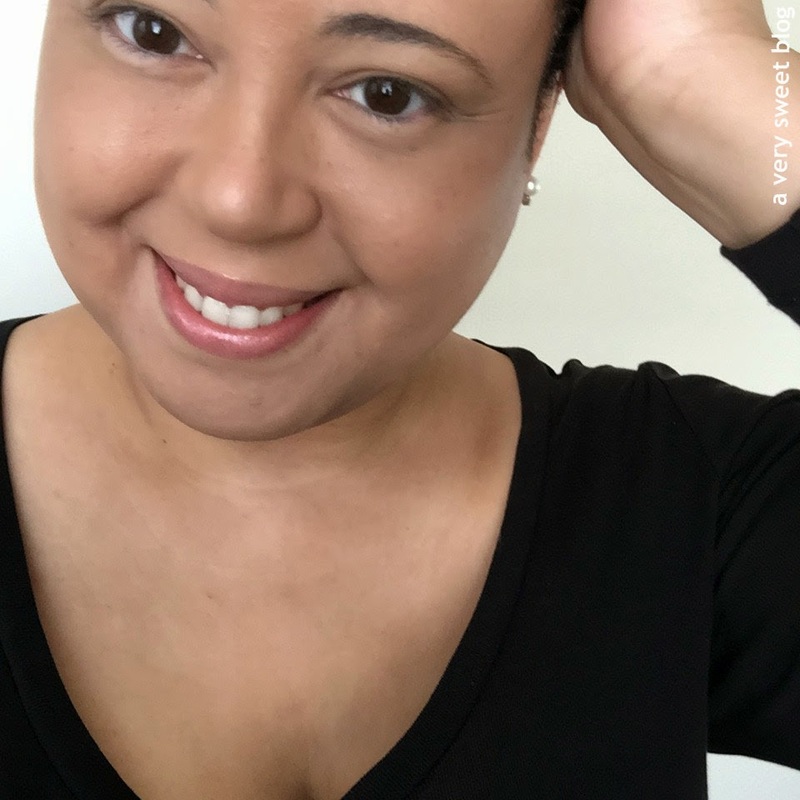 ;-) I love, read: LOVE your natural glow, Kim! I was always wondering about that glow of celebrities now I've found their secret product... haha! Using a blush by MAC for that glow at the moment! 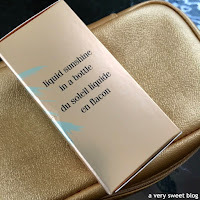 "Liquid sunshine in a bottle" sounds like a pretty apt description! 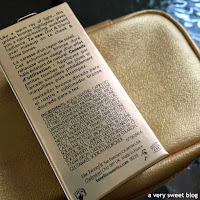 This review has come just at the right time for me as I have been considering buying this type of bronzer. It certainly sounds and looks good and I like the way it illumintes in a very natural way. I may just have to treat myself! I'm so behind with my blogging but I do enjoy following along on your Instagram account! Gotta love a golden shimmer! !